AUHS is dedicated to helping student remove obstacles to achieving success. 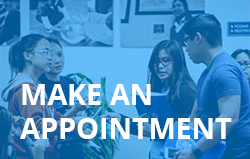 While Student Services staff are available to all students to assist in such areas as problem-solving, setting goals, attending class, academic success, financial concerns, or personal issues, once they begin matriculating are also assigned a faculty advisor. Informal, one-on-one meetings give students the chance to seek assistance, air frustrations and share accomplishments with direct feedback from University staff who will take action, if necessary to help student alleviate the concern, and, more importantly, encourage the student’s continued success. These meetings with advisors can be held any time or by appointment during regular university hours. In addition, AUHS offers peer mentoring programs that provide students the opportunity to connect with currently attending student. These peer-to-peer relationships can be great networking opportunities as well as a chance to learn about the student experience from another student’s perspective.